One of the defining features of the present-day feminist is their lack of compassion for the welfare of men/boys. This was again driven home to me this morning when I read an article ‘Suicide isn’t just an older man’s problem‘ (sub-titled ‘Suicide is increasing among young people, especially women‘). The bulk of the article is about women and young women, and how serious the problem of suicide is for them. In this article today the authors only acknowledge the issue obliquely, by way of saying that ‘yes it’s a thing, but it’s not just about men’ … before proceeding to make it all about women. Seriously? And so we have a serious social problem that disproportionately affects men, but which is largely ignored in feminist literature. 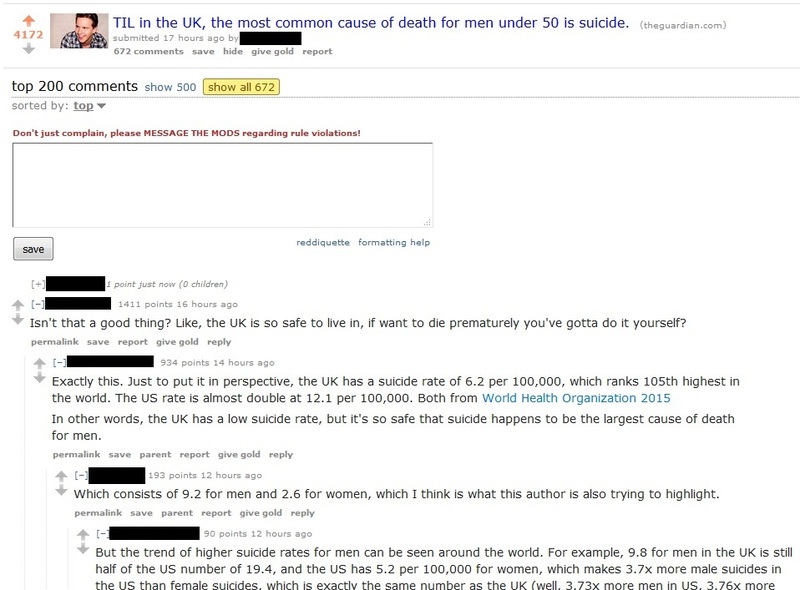 On the odd occasion the male suicide issue is mentioned, the problem is essentially blamed on men, for e.g. masculinity, and the pressure imposed by gender roles. A common theme is that the key to better means mental health is men opening up and talking to people. Oftentimes this is expressed in a simplistic and sometimes condescending way, viz. if only men would act more like women … problem solved. Yes many, but not all, men might benefit from verbalising their concerns, but much more than that is needed. Systemic and cultural changes that acknowledge the value of men, and initiatives to address the myriad issues raised elsewhere in this blog. Measures that would act as a counterweight to the prevailing gynocentric bias. That’s the scale of action required to make substantial progress towards a remedy. Oh, and take a look at this article in The Guardian … “Figures show more than one in 10 prison suicides are by women”. The other nine? Nothing to worry about. Feminist, Chidera Eggerue, doesn’t have time to worry about male suicide (Tweet dated 14 March 2019) See also this tweet dated 13 March. QLD Election FactCheck: are ‘up to 21 fathers’ dying by suicide every week? (15 November 2017) “Suicide is a complex phenomenon that has multiple causes and should never be attributed to one factor alone” and so is Domestic Violence, and yet feminists are content to blame that on gender inequality alone. “It does not surprise me that suicide among men is increasing. Forty a week is a national disgrace and the Family Court of Australia is a big part of this problem.My divorce took all my capital and reduced my ability to pay maintenance. It took my super, used to pay off the mortgage, after saying I could keep my super if my wife could keep hers. I put her through university, typed all her assignments and even writing some so that she could become a lawyer and use the system to screw me. When my wife failed to allow access to my daughter for weekends and holidays, I was told by the Family Court of Australia that it did not enforce court orders, “and especially not for men”. The rise of the ‘sad dad’ is not a divorce trend, but a gendered one (21 May 2017) Feminists say men should be more like women and express their emotions, but when they do they are mocked and accused of playing to the audience. We must not allow suicide to become normalised (16 February 2017) See readers comments, particularly in relation to author’s decision to focus on young women. What do we do now that suicide rates among young women are on the rise? (14 March 2016) It must have burned Jenna Price (‘Destroy the Joint’) to mention the word men (once) in a role other than as perpetrator of evil. Jenna thinks there needs to be more kindness shown, but presumably not the variety of kindness that radfem’s of her ilk shower on CIS-Het white men who constitute the bulk of suicides. No. of suicides in Japan drops below 25,000 for first time in 18 years (18 January 2016) Of those who killed themselves in 2015, 16,641 were men and 7,330 women. “Murder-suicide is most often perpetrated by men – but this is hardly surprising. Men are generally the perpetrators of murder, and men make up the majority of suicides in Australia, too.” Only a feminist would hold up the fact that many men kill themselves as proof that men are inherently violent. Did you watch The Project last night? They did a story on our alarming suicide rates. They did not use the words male or men once in the entire segment. They did however focus on the fact that the suicide rate of women had increased by 50% in the past year and they interviewed a woman who had once attempted suicide. The media are beneath contempt. They despise the very thought that men could be victims in any sphere of life. If I had the opportunity to speak to that smirking panel I would struggle to get a word out such is my utter disgust for their deliberate twisting of the facts and lack of compassion for victims because they are male. No I didn’t see it. Probably a good thing for my blood pressure. All those male pollies and captain of industry that the feminists never stop screeching about. And not one of them with the stones to get up and say ‘hey people, enough is enough’. Gender equality means listening to men too. To respect them also. And when they need it to offer support. The other thing you mention also really grates … gender isn’t mentioned in most articles regarding issues where it cannot be disputed that men cop most of the negative impact (or where there is gender parity). But lo and behold, any issue where women are most impacted (or they can cobble together the appearance that women are most impacted), well then the issue of gender is front and centre with catch cries of toxic masculinity, etc etc. Yes-they are masters of creating the illusion that women are the victims in almost every aspect of life when the opposite is true. I had a meltdown when I saw The Project story. My beautiful wife always supports me but my emotional responses to this type of thing must be very wearing. I wrote to Jasmin Newman (as I often do to debrief) and she got me calm and ready to fight the good fight another day. The whole suicide counseling business seems to have a long track record of failure, yet it also seems unaccountable and heavily protected against any inquiry. The media always refers its audience to several suicide counseling contact numbers anytime suicide is discussed in spite of this. The ABC covered the subject of ineffective suicide counseling once only because female rates were rising (yet still well below males) and concluded the story with advice to call the usual counseling numbers for presumably, the usual hopeless advice. It may well be that high male suicide rates suit the feminist agenda and so, with our present assembly of nutless trembling mangina politicians nothing will be done until we vote for some changes.